With the rise of technology and robotics, more and more we are looking at a world we only dreamed of in movies and video games. 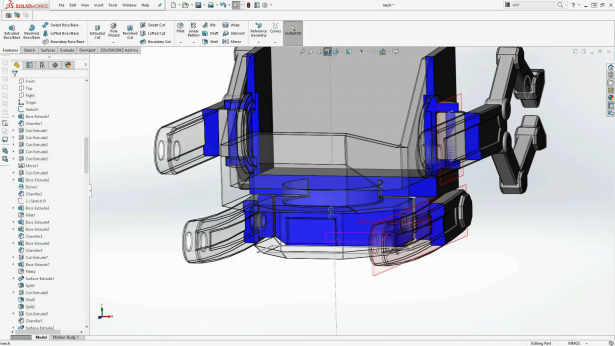 With the power of SOLIDWORKS and 3D printing, we can start here at home to bring that dream alive. 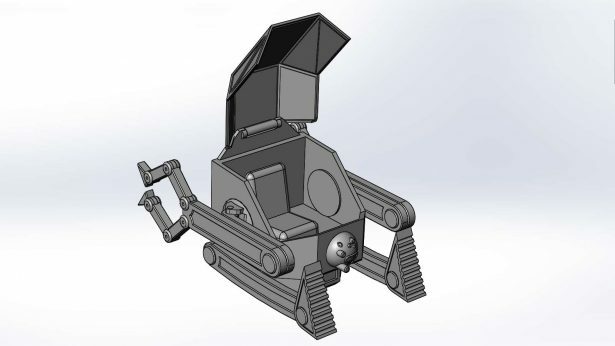 In this tutorial we have designed our own mech machine that is not meant for war, as they are often portrayed in fantasy, but to help in disaster areas. Instead of using diggers to clear up rubble to make a clear path for larger machines, this can climb over rocky terrain and get into the affected area quickly to help those in need. 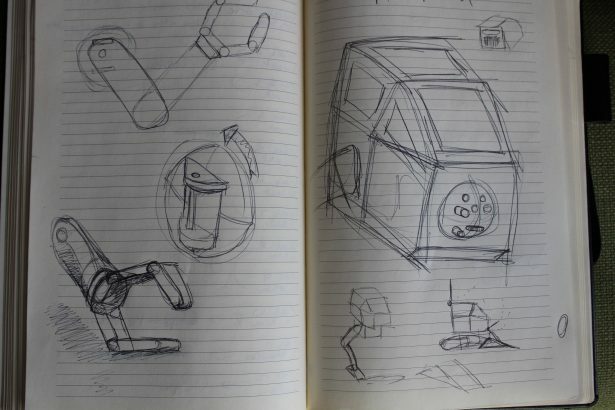 Inspiration for this design was taken from both real world machines and those in games and movies. 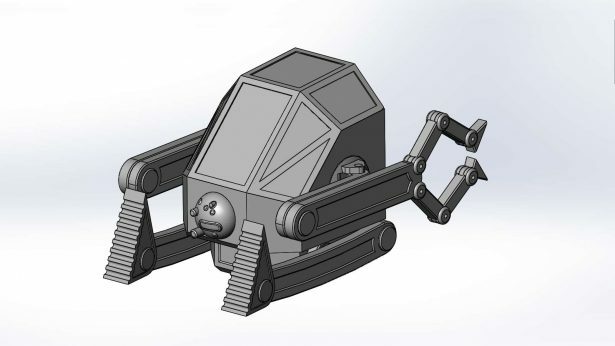 We looked at the AT-ST style walkers from Star Wars, the pod pilot system seen in Titan Fall and then some real world mechanisms to make it move. 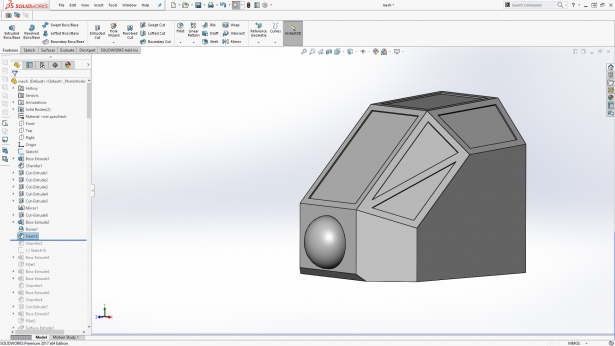 Now, to get that idea from a sketch into a 3D environment, we are using SOLIDWORKS, and then 3D printing the first prototype. 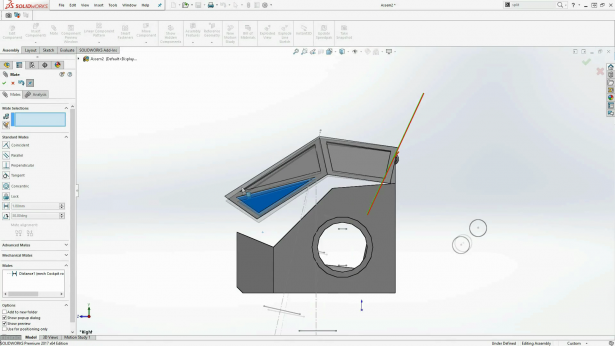 Sketching out your ideas is a great way to understand and develop your idea before building the model in SOLIDWORKS and realizing it won’t work on paper. 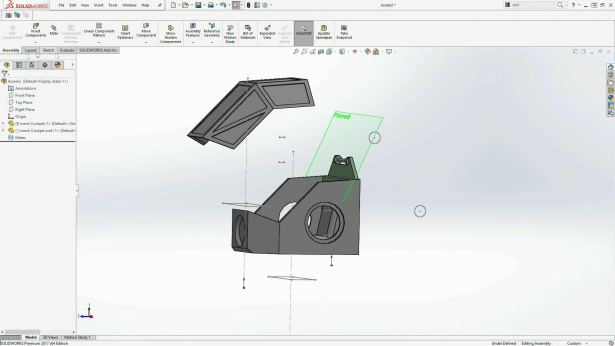 Sketch the model in your mind to figure out beforehand what features and shapes you are going to use; this will make the SOLIDWORKS model a breeze. While building this model, I had no serious issues in terms of creating the shapes because I knew my basic road map. 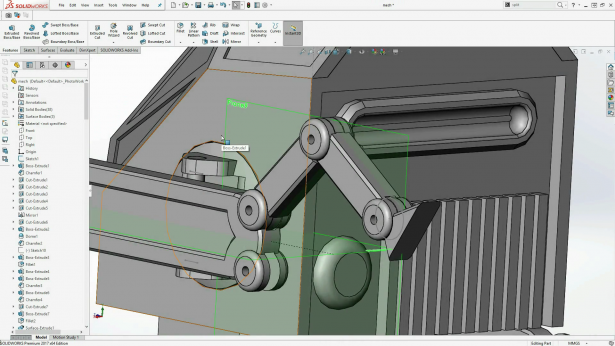 The only thing I wasn’t too sure about was the joining mechanism I was going to use; this I could only figure out once the base model has been built. For the larger joins, I thought the simple pin joins would work as the joints were big enough, but the finger joins were much smaller. I decided to try something new and instead of 3D printing pins that would be too small, I thought I would try out using the actual 3D priming filament instead. We shall see soon (in part 2 of this blog) if this will work or not. This Mech’s limbs are all symmetrical, so this cut the modelling time down a little bit by only modelling the left side and mirroring over the bodies to the other. 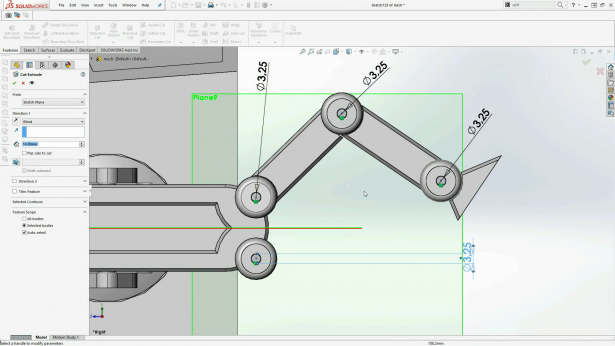 If you wish to add any details that aren’t symmetrical then you can do this after the mirror feature. With a model like this where there are a lot of chamfers and fillets. Often you could think this will look cool as a radius but then you zoom out and it looks too soft. 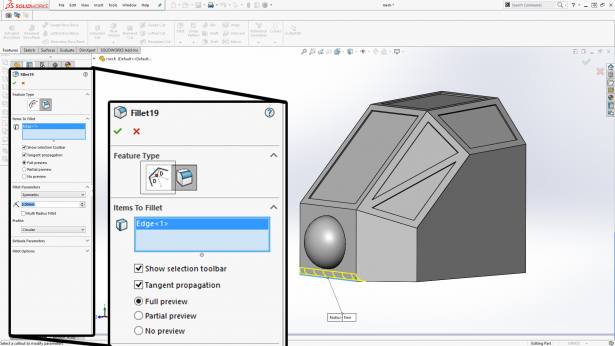 This new feature in SOLIDWORKS 2017 allows you to instead of deleting that whole fillet feature and reselect every little line, you can just edit the feature and change it to a fillet with one button. With a model like this that we designed to fit a pilot and to open, you need to design the interior. This can be done with the section feature but this ‘cuts away’ the section you don’t want to see and sometimes you need to see that part. 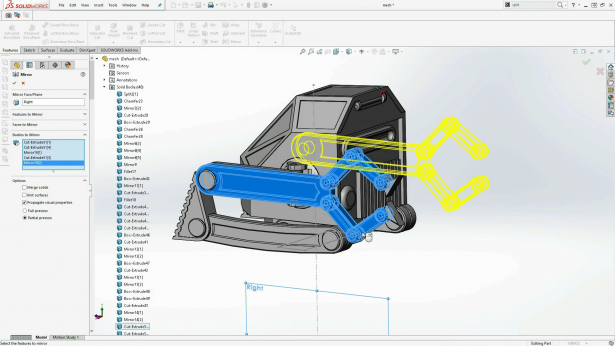 The new transparent feature within the section feature shows the hidden parts as transparent, this made it a bit easier to design some of the moving parts inside the mech. I built this model in one part file so I can see each part in relation to the other. If I was to build each part as one single file and then add it into an assembly, entails swapping from one file to another and only seeing the results in a 3rd file, which is a little time consuming. This way I can see it all in one go and know it will all fit together. Now that the model is complete, I then saved each body into their separate part files; I could then save them as STLs and build any assemblies to test any joins I was unsure of. I built an assembly of just the cockpit and the cockpit roof to see if there are any collisions as it opens. I saw a small collision so I then edited the roof to clear it, making it a smooth hinged door. I designed this model in its standby state where it is basically folded up, this allows us to design it with transport and size in mind. 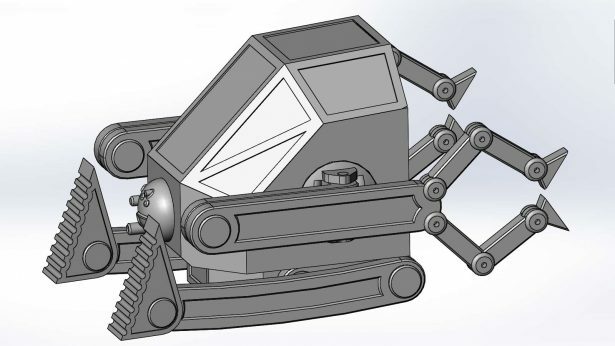 I could then take this model and build an assembly of it standing, but we want to save that mystery for the next blog where we will 3D print the prototype of the amazing Mech design. Designs and ideas like this can be built on to and taken even further than this one has been taken. This is just our little idea and would love to see what bigger ideas you have. As always, thanks for reading! Check out our Time-Lapse Tutorial playlist to hold you over until part 2!